From the I Voted! department... Crown City Rockers @ Emo's on Oct 28th! 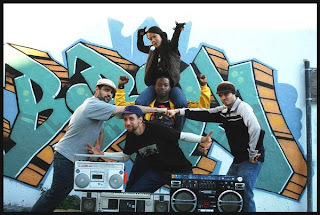 Crown City Rockers are a five-member hip hop band from Oakland, California, by way of Boston, Massachusetts and Pasadena. Formerly known as Mission:, they play old school inflected hip hop music with live instrumentation, citing influences such as A Tribe Called Quest, The Roots, KRS-One and De La Soul. They are currently working on their upcoming album 5 Gold Stars.